It is time to get organized for Christmas and this countdown advent calendar is essential to my strategy. Getting organized for Christmas is pretty natural for me. I have a six month agenda for Christmas because I make so many handmade things (and, yes, this year I am so very behind). I sent out my family wish lists in mid-October but I have yet to buy a single gift. I usually make my Christmas cards in July, but not this year. However, I do have my trusty 25 days till Christmas Calendar. I shared the story of how I was inspired to make an advent calendar last year but the story is too good not to re-share. My son was 3.5 when he started to show extra excitement at the mention of Christmas. He could remember the Christmas from the year before so he understood what it was all about. Ya know, that Santa gives presents to good little boys and girls. In my enthusiasm, I set out our tree the first week of December. Yes, its early, but did I mention I LOVE Christmas time? Every morning, afternoon, after nap, after dinner, ALL the time, my son asked about the presents under the tree and Santa and everything. My son has some serious focus. He was driving me crazy, but I was dealing. Then about 5 days before Christmas, everything got quiet while I was cooking dinner. For my son, quiet is a bad sign. So I looked in the living room and found him softly sobbing in a corner. When I gently leaned down to ask him what was wrong, he replied in the most adorable, sad, meek voice, “Santa isn’t coming because it has been too long.” Lesson learned, heart-broken, countdown calendar made. to make my own, but there is also this beautiful wooden kit. I did not like the thumb punches on the boxes so I turned them around and used the flat side. I taped little ribbons on the bottom of each box to use a pull-outs. 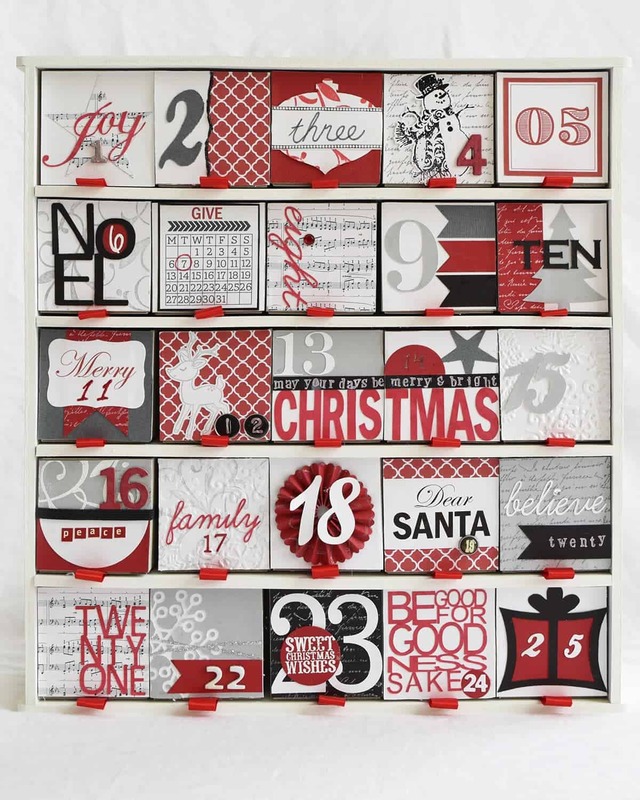 I was inspired by this Advent Calendar kit from Kerri Bradford which is available for purchase I think but I am not sure where. This project required heavy use of my cutting machine, some stamps, my stash, and solid cardstock. I bought not a single decoration for this project. The great thing about this calendar is that it gives an activity each day that I would already be doing such as “Go buy the tree”, “Visit Santa”, or “Bake Cookies”. I even scheduled a few “Mommy is off” days which I put candy or a small toy in. I didn’t want to give my son candy every day like many other calendars do. This calendar allows me to plan out the entire month and see how I am going to get everything done in time. I made this for Blake, but Mommy likes it as much as he does. Want more Christmas Projects to make your home beautiful? I’m so excited for xmas this year! To be honest, I had a year where I about lost it from stress. I took on too much by planning to make 25 handmade cards, handmade tags, decorations, christmas work party cooking, host one family for christmas and travel to the other family 3 states away, and probably more that I have forgotten. Oh and Blake was teething or something. After putting my poor hubby through dealing with me, I vowed I would never let it get that bad again. That calendar was probably my favorite decoration ever…but I just finished a sign for the mantle that I AM LOVING! Thanks so much Ginnie. I bet you will have some wonderful treats in yours. I can’t believe the holidays are so close. Hello cute lady! This looks fabulous! Pinned and tweeted. This was one I picked as my favorite from our last party. Woo Hoo! We will be featuring it at our party tonight at 7 pm. I hope to see you there. I loved doing Advent Calendars with my kids! Good memories…thanks for sharing this one with the Thursday Blog Hop! Great idea Rachel! And it’s super cute!! We have an advent calendar every year too, but I like your idea of not giving candy everyday more. I may have to make our own advent calendar this year. Thanks for the inspiration. Thank you, Silvie! I hope you do get time to make your own calendar with whatever you please in each day. Someone was just telling me this morning that they do green eggs and ham for dinner one night and last year they had a paper “snow ball” fight in the living room. There are so many great things to do with them.